The Nike Golf – Dri-FIT Cross-Over Texture Polo Style 349899 is available in Adult Sizes: XS-4XL and comes Black, Midnight Navy and New Blue. Has a great look and the quality you expect from Nike. Features of the Dri-FIT Cross-Over Texture Polo include: Nike’s incredible Dri-FIT fabric, an understated cross-over pattern that takes the style up a notch, solid flat knit collar, three-button placket and open hem sleeves. The contrast Swoosh design trademark is embroidered on the left sleeve. Made of 6-ounce, 100% polyester Dri-FIT fabric. The Nike Golf Dri-FIT Cross-Over Texture Polo is available in Adult Sizes: XS-4XL and comes Black, Midnight Navy and New Blue. 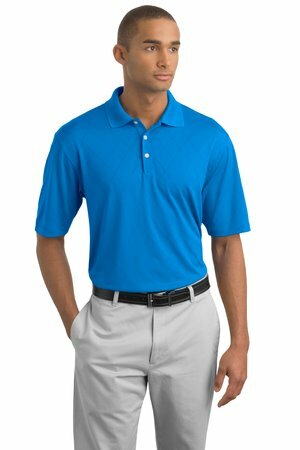 Be the first to review “Nike Golf – Dri-FIT Cross-Over Texture Polo Style 349899” Click here to cancel reply.